being MVP: $100 Umi Shoes Gift Card #Sweepstakes :: 3 Winners! 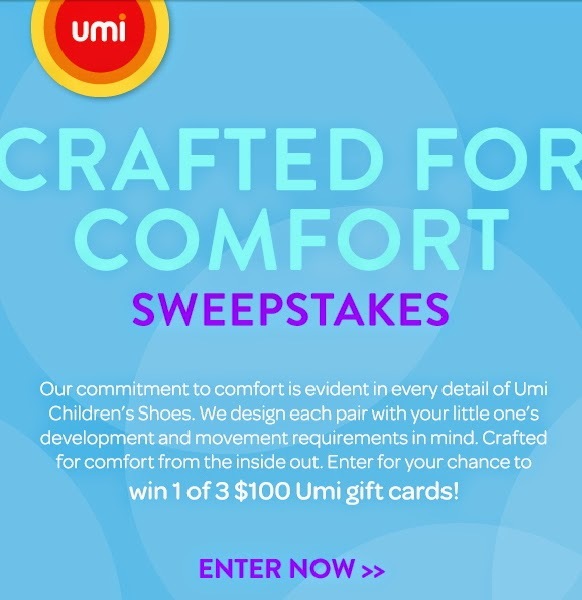 $100 Umi Shoes Gift Card #Sweepstakes :: 3 Winners! Comfortable shoes for active kids are a must and Umi Shoes delivers. Not only are they stylish and on trend, they are just super supportive for little feet. Kenzie and Mason both love their Umis and what better way to celebrate the Spring season than with new shoes for your tot? Check out the collection and enter to win 1 of 3 $100 Umi Shoes Gift Cards! *Sweepstakes ends 5/3/15 and open to US residents. Good luck!